What brought the English Puritans to the colonies in the first place? The two main reasons were the search for religious freedom and the pursuit of economic opportunities. While some colonies—such as Pennsylvania and Maryland—were founded specifically for religious purposes, others were founded primarily for their economic value—such as Georgia and the Carolinas. Many Puritans in England in the late 15th century were persecuted for their religious beliefs and for their open disagreement with the Church of England's broad interpretation of the Bible. Shiploads of pilgrims traveled from England to Holland looking for refuge. The passage was safe, the cost of living was lower, and the Puritans were free to practice religion as they wished. However, Dutch culture was very different than what they were used to, and they felt Holland's society was too liberal. Thus they made the decision to settle across the ocean. Not all attempts at early colonization in the Americas were successful. Roanoke Island, known as the "lost colony," failed after two attempts, while the residents of Jamestown Colony suffered until the devastated settlement eventually became part of the Virginia colony. Establishing a new kind of government was also important in the founding of the American colonies. While early colonial governments were unstable and imperfect, the American ideal of democracy continued to evolve with each colony's success and failures. This gradual change allowed the voice of the common people to be heard, and religion slowly became separated from matters of state. 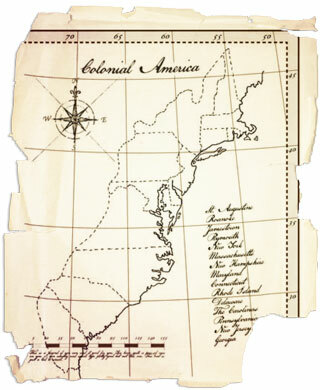 Presented here, in chronological order of their establishment (not statehood), are historical sketches of the original 13 colonies, as well as historical accounts of the earliest European settlements in the New World. Each story is unique, with notable personalities emerging as American history's heroes and villains. Woven together, these pages tell the story of our nation's early years—Colonial America.